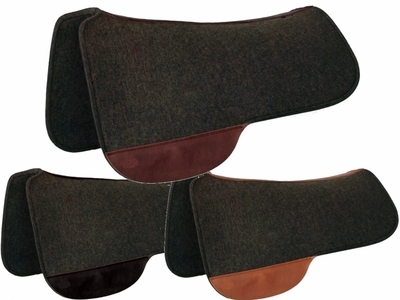 New Wool pad to fit Tucker saddles. Wool felt is the preferred material because it naturally absorbs shock and wicks away moisture-keeping your horse cool and comfortable. Pads are contoured, and have oil tanned wear leathers. Semi round skirt shape. 3/4" thick 100% Virgin wool-black. Pad depth 17" front; 13" rear. Wear leather length 15". Pad Choice of 28" or 30" lengths. Wear leather color choice to match your saddle: Black, brown or golden oil tan.